Samsung currently has two flagship lines: the Galaxy S series that is refreshed in the first half of the year and the Galaxy Note line that gets a new version in the second half. The company is preparing to release a foldable smartphone dubbed Galaxy X next year, which was rumored to affect the Galaxy S10 launch timeline. Previous reports suggested that Samsung could unveil the Galaxy X at the Mobile World Congress (MWC) next year. The same report added that the Galaxy S10 launch would take place at the Consumer Electronics Show (CES) in January. A new report indicates that Samsung is not going to change the Galaxy S10 launch date for the sake of a new and unproven Galaxy X. Sources familiar with the matter told Chinese tipster Ice Universe that Samsung’s first foldable smartphone will be showcased at the CES in early January in Las Vegas. An announcement at CES could mean the Galaxy X might start shipping in February or March next year. Last month, Shinhan Financial analyst Park Hyung-woo told clients that Samsung was planning to showcase the Galaxy X to its European and US carrier partners at the Consumer Electronics Show (CES). Anyway, Samsung is expected to produce the Galaxy X only in small quantities – 300,000 to 500,000 units – initially. The device will be sold only in South Korea. Depending on consumer response in Samsung’s home country, it could be introduced in other markets towards the end of 2019. One of the reasons behind its limited production is that foldable OLED screens are difficult and expensive to manufacture at large scale. Golden Bridge Investment analyst Kim Jang-yeol predicts the Galaxy X could cost as much as 2 million won in South Korea. That’s roughly $1900, making it twice as expensive as Apple’s flagship iPhone X. If Samsung launches the Galaxy X at this high price, only a small number of Samsung fans will be able to afford it. The Galaxy S10 launch will take place at an Unpacked event around the Mobile World Congress in late February. This year’s Galaxy S9 was also unveiled at the same event. Samsung tends to hold its Galaxy Unpacked event a day or two before the MWC kicks off in Barcelona. The MWC unveiling is a clear indication that the company isn’t worried about the lower-than-expected Galaxy S9 sales. Past reports have claimed the Galaxy S10 could arrive earlier than usual to make up for the lackluster Galaxy S9 shipments. The Galaxy S10 will mark ten years of Samsung’s most successful smartphone line. So, we expect Samsung to overhaul its design, similar to what Apple did with the iPhone X. According to the rumor mill, the Galaxy S10 will integrate the fingerprint sensor under the display, meaning there will be no rear-mounted fingerprint reader. It is also expected to offer 3D facial recognition similar to the iPhone X’s Face ID. Samsung is working with Mantis Vision to integrate 3D sensing modules in its phones. If the company incorporates the 3D sensor, it could do away with the iris scanner. At least one variant of Galaxy S10 is said to feature a triple camera system on the back. There would be three models – one with a single camera, another with a dual rear camera, and a third with a triple camera, according to Korean site ETNews. The devices are code-named ‘Beyond 0,’ ‘Beyond 1,’ and ‘Beyond 2’. Other rumored features include a piezoelectric speaker, a microSD card slot, at least 6GB RAM, and a 3.5mm headphone jack. A few days ago, ETNews reported that Samsung Display would start trial production of flexible OLED panels for the Galaxy X later this summer. The trial production will help the company identify and fix manufacturing issues. Mass production will begin towards the end of this year. Samsung Display aims to produce only about 100,000 panels this year before ramping up to one million units in 2019. The Galaxy X will have a 4.5-inch display when folded, which will measure up to 7.3-inch when unfolded. Sources told ETNews that Samsung has decided not to fold the display in half due to usability issues. The display will not be visible to users when folded, which means they will have to open the device every time they want to check notifications or see time. The company has come up with a unique solution to fold the display only by two-thirds, leaving the top one-third area exposed. The top third portion will give users quick access to things like notifications, time, missed calls, battery percentage, and more without having to unfold the main screen. The Galaxy X could also feature a flexible battery of up to 6,000mAh capacity. According to ITHome, Samsung SDI has developed a flexible battery that can store 3,000mAh to 6,000mAh power. 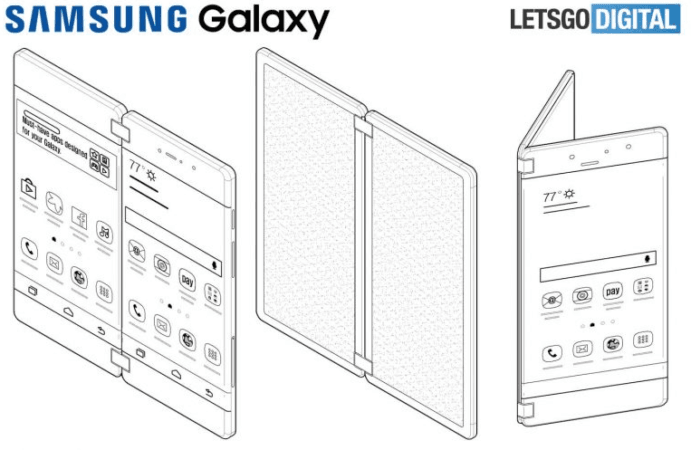 Samsung’s mobile business head DJ Koh has assured fans that the foldable phone will not be a gimmick. Samsung will also have to heavily customize the Android software to optimize the user experience for its foldable design.